Today is a very sad day for me as my old penpal Elizabeth McClung has passed away from her terminal ilness on the 29th May 2013. Whilst i am sure she is at peace and out of pain my sypathies and heartfelt wishes go out to her wife Linda who cared and loved her for all their years together. Elizabeth-san was indeed my sempai as she inspired me to follow my dreams no matter what happens. 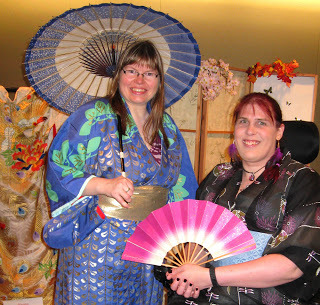 I first started reading her blog 'Screw Bronze' when i was looking up information on my passion Japan and i saw all the amazing things she did there despite her mobility issues she still had an amazing time. After that i diligantly folowed her blog and then signed up to the postcard project where she sent me 3 beautiful postcards and i sent her letters, emails and parcels to try to make her feel better. She was an inspiration to many and the world is lucky that she strove to make the world that little bit more of a better place fighting for herself and others and making the world just that bight brighter. I am deeply saddened to hear of her passing and i hope that she finds her place in the next world among all the great women of the past because its where she deserves to be.